Often entrepreneurs attend conferences and industry meetings where they have an opportunity to network with and meet investors. But, often these opportunities are not well utilized and entrepreneurs fail to get the complete attention of the investors. Through the day, investors are flooded with proposals, calls, mails and face-to-face interactions, where entrepreneurs request for meetings. It is impractical for investors to accept all requests, and therefore, they end up using some criteria to filter and select, who they would like to meet. And, in the absence of any other criteria during one-on-one interactions in business conferences, the criteria used is the entrepreneur’s ability to clearly articulate the concept and the degree of passion driving that concept. For example, during the brief interactions at conferences, investors tend to seek more information, either through a longer conversation (rather than just giving a card and saying “Send me a mail and we will see” ) or calling for a follow-up meeting, from those who leave them with the feeling “Ah, this seems like a good concept, a good business case and this person seems to be sensible and smart enough to build a business”. 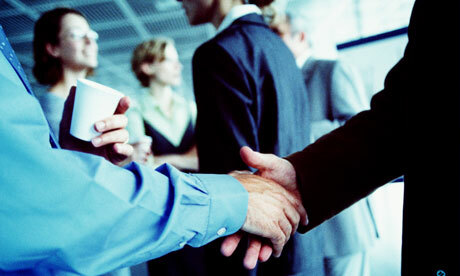 Here’s a list of things you may want to consider, when attending networking meetings where you may meet investors. The key message here is that you need to PREPARE a brief pitch, practice it and deliver it as if it is extempore. Keep a 1-line descriptor about your company ready. When someone asks you what you do, rather than going into a long story, you should be ready with a one-line answer. (e.g. the descriptor of The Hub is – we help startups build sharper business plans). Convert this statement into an introduction. e.g. “Hi, I am Prajakt, co-founder of The Hub for Startups. We help startups build sharper business plans. We conduct a 3-Day Boot Camp and a 1-Month Business Plan Builder Program”. Pause. Wait for the other person to respond. Add on more information, only if, there is build-up of interest and the conversation continues. Else, it becomes a monologue with just meaningless and disinterested nods. Not all investors attend conferences to seek entrepreneurs and hence, even if your concept is interesting, they may not be receptive at that forum. In such cases, it is best to leave your business card and move on with an email as a follow up. At the back of your business card, put a 2-3 line descriptor of what you do. Because investors meet with a number of entrepreneurs, it is difficult for them to remember who you were, especially if the name of your company does not explain your business. e.g. if the name of your company was Travel Guru, you may not need a one line descriptor. But if it were 5 Clove, you will need to put a descriptor, so that the investor later remembers you as that ‘interesting’ person whom they would like to have a follow-up meeting with. If there is interest in continuing the conversation, then provide additional information. E.g. “Our programs are quite popular with aspiring and recent entrepreneurs and we have had several success stories. We are now in our expansion phase, and that’s why I am at this conference… to present our business case to potential investors”. From here onwards, see how the conversation goes. But be prepared with the list of things YOU want to discuss and want to highlight. Make a list of the key messages and highlight what you want to mention during your conversation e.g. Entrepreneurs background (if it is relevant to what you do e.g. If you have worked at e-bay before and are now starting an e-commerce company, it makes sense to state that. However, if you were working with a healthcare company, and now starting an e-commerce venture, that may not be the most important point to state at the first meeting). What have you done so far – This could be about the background research you have done, the prototype you have built, the concept validation you may have done, the traction you may have got, the initial feedback or orders from a few initial customers. Essentially, it means, you may want to be prepared in your mind with a list of things that you have done in your entrepreneurial journey. (And remember, the journey begins not from the moment you start your company, but from the moment you decide to be an entrepreneur). What are your aspirations and goals – Investors like startups with large aspirations. But when stating your aspirations and goals, be as specific as possible. E.g. Saying “We want to be the leading e-commerce company in the school supplies segment” is not a good enough statement for anyone. You may want to say “In the next 3 years, we aim to be among the top 3 school supplies businesses online. And our plan is to get to about USD 10 million in 3 years, and in the next 10 years or so we aspire to be anywhere upwards of USD 250mn in revenues. We believe the market potential in India itself to be about USD 1 billion”. Sounds better, doesn’t it ? How much funding are you looking for and what will the monies be used for – the key to this answer is specificity. Different investors invest in different stages of a venture and hence it is important for them to assess whether your stage is right for them, and if the amount of investment you seek, is within the range that they want to invest in. (Often entrepreneurs end up asking for angel/seed-stage funding sums, which are often much lower, from VCs who typically invest higher sums of money. If you need USD 50,000 to get going, there is no point in seeking that from an investor who typically invests upwards of USD 1 – 2 million. Therefore, do research on different investors so that you are well aware of whom to target.). Most importantly, after attending business conferences and industry events, be disciplined about writing to those you interacted with. Keep the mail message short and personal. DO NOT CUT-AND-PASTE A STANDARD MESSAGE ABOUT YOUR ORGANIZATION. No one reads through that. The intention of the follow-up e-mail is NOT to spread information about your company. It is to gain their attention and establish a relationship, or at least get an opportunity for a follow-up meeting. …..AND ALMOST ALWAYS WHEN I READ AN ARTICLE RELATED TO CORE ‘ENTREPRENEURSHIP’ ALL ALONG THE LINE OF THOUGHTS, I END UP SAYING YES, YES AND YES THAT TOO…..THAT IS PRECISELY WHAT IS GOING ON WITH MY ROCKY ENTREPRENEURIAL JOURNEY…..BUT YET ITS NEVER A CERTAIN PATH, A DEFINED ROAD WITHOUT ROADBLOCKS AND HICCUPS ALL THE TIME ROUND THE CORNER WAITING TO HUG YOU! THIS IS PROBABLY ONE FACT THAT THE ENTREPRENEUR BETTER GET USED TO RIGHT FROM GET GO…….BUT THE ROAD IS BY FAR DAMN STICKY FOR ONCE YOU ARE ON IT…..YOU LOVE IT AT TIMES , YOU HATE IT AT TIMES BUT YOU CAN NEVER GET OFF IT SO EASILY!! AND MENTORS DON’T MAKE IT ANY EASIER MOST OFTEN 🙂 …..LEAVING ENTREPRENEURS WITH LOADS OF GOOD ADVICE BUT ALWAYS THAT BOARD THAT READS – ‘GO FIGURE IT YOURSELF’ HANGING OUTSIDE THE DOOR! Previous Previous post: Crowd-funding for startups. Is it a good idea? Next Next post: How can i minimize the starting cost of a startup?